Thanksgiving comes but once a year & who wouldn't want these two Pilgrims in their home? Jonathan & Priscilla measures 27.5" x 34.5" & uses both fusible & machine applique to feature these two against the sky & hills. Standing there with their pumpkins & cornstalk, Jonathan has his gold buckle shoes while Priscilla is wearing her bonnet. 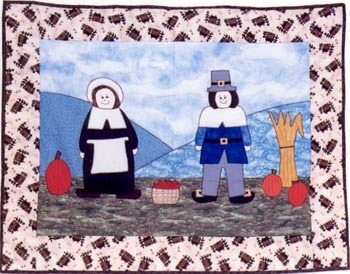 Complete from head to toe, invite these applique pilgrims into your home to help you give thanks this season. Price includes shipping and handling.